This weekend trip will knock off another 'must dive' location from your bucket list!! Drive to South West Rocks on Friday afternoon and dive on Saturday and Sunday morning. 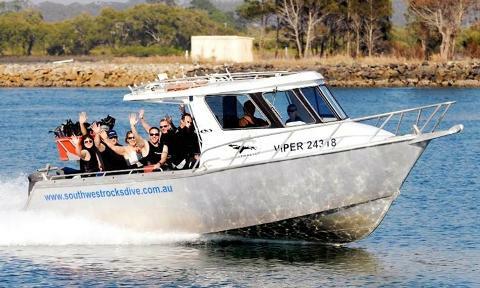 South West Rocks Dive Centre is a family owned business that operates since 35+ years. 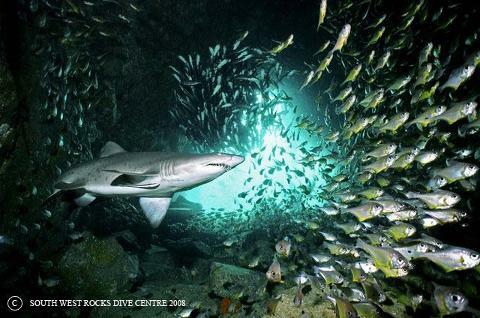 Fish Rock Cave, the only true ocean cave dive in Australia running 125 metres right through Fish Rock which lies two kilometres south-east of Smoky Cape – South West Rocks. Fish Rock is home to a completely unique ecosystem. The temperature inside the cave is always at least one degree warmer than the surrounding ocean and the water is always clear. The shallow entrance of Fish Rock Cave at a depth of 12 metres is a large naturally lit cavern fringed by pink gorgonian corals and teeming with enough life to fill an entire dive. You can even go up into the bubble cave and talk to your dive buddy while being five metres underwater! The deep entrance of Fish Rock Cave is at a depth of 24 metres. You can also to see resident black cod, large wobbegong sharks, black rays and giant cuttle fish before ascending up one of the two chimneys into the main section of the cave. 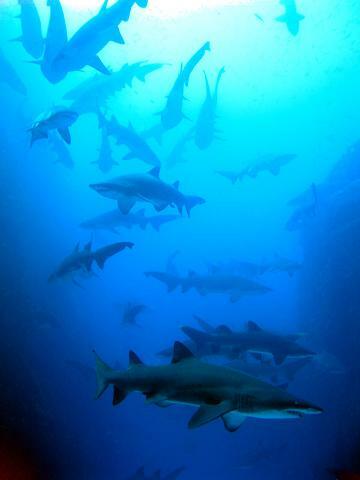 Grey Nurse Sharks can be seen at Fish Rock all year round. 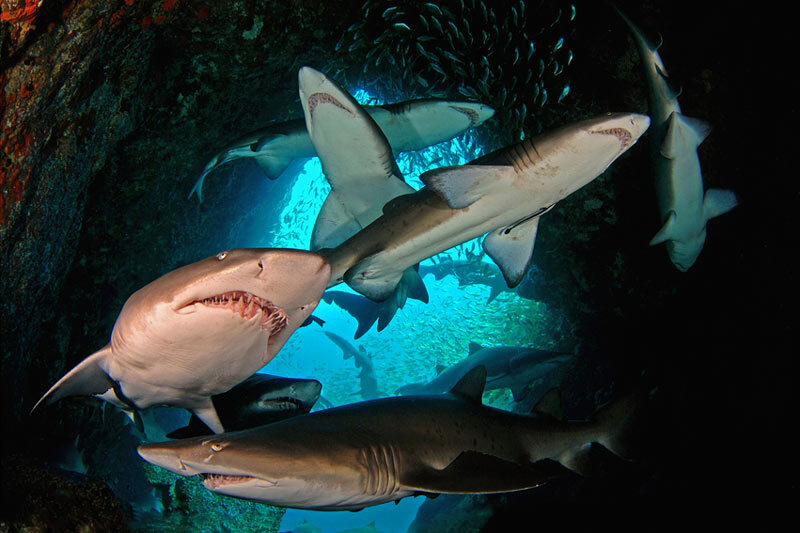 In summer months, Grey Nurse Sharks rest in the shallow entrance of the cave, which is an awesome diving moment for even the most experienced diver! This also presents an unparalleled photographic opportunity for novice and experienced photographers. We offer a range of digital cameras for hire upon request. Around the island the depth varies on average between 15 and 30 metres and deep gutters form perfect aggregation areas for the sharks and other marine creatures who reside here. The western fringe of Fish Rock is washed by the currents that bring the diverse range of marine life to the area and you can expect to see lots of fish, turtles, moray eels and friendly blue groper. The eastern side of Fish Rock is spectacular. Sheer walls plunge to an average depth of 30 metres in an area that is rarely affected by current. Boulders the size of small houses line the sea floor and are home to large wobbegong sharks disguised amongst clouds of bullseyes. a huge variety of fish life. The divers lodge is located above the dive shop. 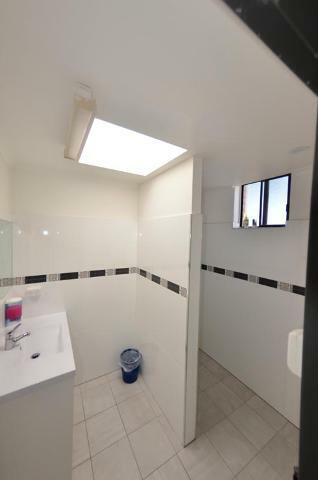 It has three large bedrooms, four showers and two toilets which are located adjacent to the bedrooms. 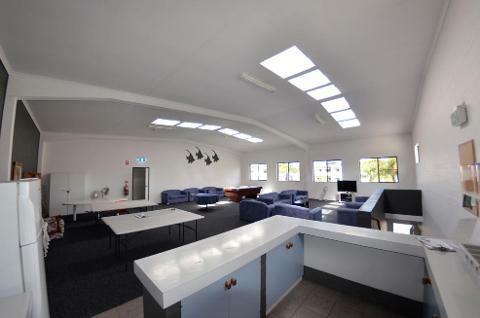 A kitchen is located in the recreation room, with a large refrigerator to keep your drinks cold. Electric fry pans and a microwave are available to cook dinner. A Gas barbecue is also available outside for use by guests. 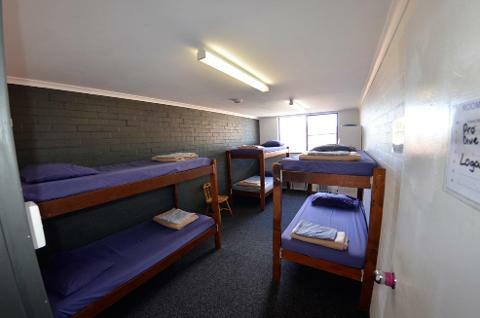 After diving, you can relax in the huge air-conditioned/heated recreation room which is equipped with a pool table, television, dvd, video library as well as plenty of space to just write up your log book. Available at cheap "All Weekend" rates on the next page. 50% deposit is required at time of booking.